With the new GT320 model Invictus raises its philosophy as outlined by designer Christian Grande, with features which are part of the smaller 280 and bigger 370 GT models, and in the same time renewing the identity of the brand and the GT range. From the GT280 the 320 takes its dynamic properties, which combine with the large living areas inspired from the GT370 flagship. The Invictus GT 320 follows family design features from the reverse bow, further emphasized by the oval-section edge that runs the length of the boat, from the bow down to the stern swim platform. The Invictus GT320 deck layout offers access to the cockpit via the stern swim platform, moving left of the large sundeck, which can be further expanded by transforming the fore sofa. In the middle of the cockpit, the L-shaped dinette has a table and faces a real outdoor galley; with fridge, ice maker, grill and basin, all neatly tucked into a stand-up cabinet in Invictus style which can conceal all behind doors. The cockpit can be sheltered by a standard hidden sun canopy. Among the Invictus GT320 optional, the carbon hardtop stands out and this can be extended to provide more shade with a transpiring, ventilated fabric held in place by carbon rods. The pilot and co-pilot chairs, with a bottle-holder between them, add value to the helm station. At the bow, the large sundeck has headrests positioned on the deck-house, creating relaxing areas. Inside the Invictus GT320 has a transforming dinette along the port topside, with a container cabinet on the starboard side. At the stern, a second open-space cabin with double bed makes the best of the cockpit’s architecture, without adding weight to the boat’s profile, which appears slim and streamlined. A bathroom is in the center of the cabin areat and has all the comforts needed to fully enjoy life on board. 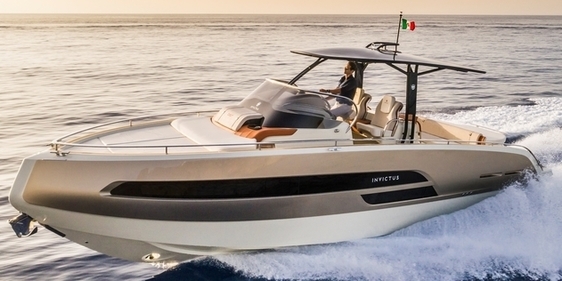 Invictus GT 320 is powered by engines up to twin 430hp in various stern drive propulsion from twin or single petrol gas or diesel engines. Invictus GT series is very much a semi custom project and the GT 320 is no exception offering eight color options for the exterior and a variety the interesting option of the carbon T-Top or a fully open look.